I selected this book today, well... because we've spent the weekend out at our farm and this book was in the car and the boy asked to read it a few times yesterday so it is top of mind and I really didn't have any other plans so what the hay. Still in print and illustrated by the guy who brought us Curious George, there are animals all over these pages. A veritable Pangia where lions and monkeys and kangaroos and American deer all frolic happily together in a world of bliss, that is... except for one little evolutionary miscalculation. 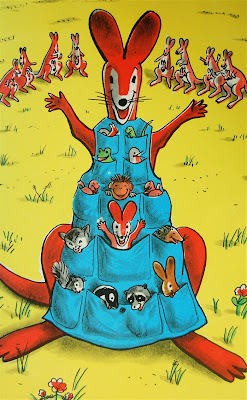 You see, poor Katy Kangaroo was born without a pocket in which to perch her son Freddy. She seeks advice from the other mommas in the animal kingdom, but eventually finds the help she needs from a nice carpenter man she meets on the street. Katy went up to him and laid a paw on his arm. He was a little frightened, but Katy looked at him with her soft brown eyes and said, "Please, dear, kind man, where did you get all those pockets?" "These pockets?" he said. "You want to know where I got these pockets? Why, they just came with the apron, of course." I always liked reading this one to my son. I like this story and so did the kids at my center. In fact I like all the books written or illustrated by H.A. Rey. sooo cute. i need that apron, now. oh, all the things it could hold. "My son loves the mother/child dynamic, and often, I think, wishes I had a pocket of my own into which he could retreat." That's totally how I was with my mom when I was little. I posted a comment earlier about Joey Runs Away... my mom used to call me her little joey and I would pretend to be her baby kangaroo, hehe. I've always been an advocate of downtime at work. :) keep reading! I took this book out every week when I was in 1st Grade, even though the librarian would ask me "Are you sure you want to take this book out again?" Of course I do! That was in 1962.